I'm multi-tasking -- writing a column, watching "Desperate Housewives" and sipping a cappuccino at my local coffee shop. I'm not near a TV but I am holding the new "video" iPod in my hand. I put video in quotes because this new product from Apple is just called the iPod. That's because Apple, in a way, is downplaying the video part of the new device which replaces the existing hard-drive based iPods. If you liked the old iPods, you’ll like the new ones even better. 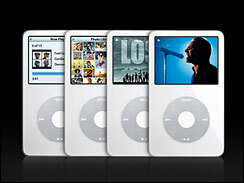 Even if you never watch video, the 30 GB version has all the features of the old iPod, yet it is 31 percent thinner, stores 50 percent more music and sells for the same price ($299) as the old 20 GB version. Apple says that the 30 GB model can store 7,500 songs, 12,500 photos and 75 hours of video. Double that for the 60 GB ($399) model which is a bit thicker than the 30 GB version, but still thinner than the old 20 GB iPod that Apple recently discontinued. Apple continues to sell the tiny iPod shuffle (up to 240 songs) and the new four gigabyte iPod nano that stores up to 1,000 songs. "Desperate Housewives" looks about as good on this 2.5-inch screen as it does on my TV, only a lot smaller. Although the resolution, at 320 by 240 pixels, is far from what you get with a high definition TV, it looks great precisely because the screen is so small. If you were to project the same video on a larger screen it would be fuzzy, but as long as you’re watching it on a tiny screen, it looks great. An optional $19 cable lets you connect the iPod to a regular TV set which, though larger, won’t be nearly as crisp as what you see on the little screen. Given a choice between watching a show on an iPod or a 42-inch plasma or even a regular old TV set, there’s no contest. I’d rather watch TV on a real TV and I love watching it on a big screen high-definition set. But the experience of watching a show on this little screen is better than you might expect, assuming that you have it pretty close to your face. The sound through Apple’s standard white earbuds is also quite nice –- certainly better than the speakers built into most TV sets. There’s good news and bad news when it comes to battery life. The good news is that Apple rates the 30 GB model at 14 hours of battery life for music, but promises only 2 hours of video playback. My battery made it easily through two, one-hour shows, but two hours of TV without commercials is really only 86 minutes. The 60 GB model, which has a thicker battery, is rated for 20 hours of music and 3 hours of video. Speaking of battery, the units no longer come with a power supply. Instead, you charge them up by plugging them into the USB port of a PC or Mac. An optional power supply (a good idea, especially if you travel) costs $29. While I like the way video looks on an iPod, I’m not thrilled with the ergonomics of watching video on a 2.5-inch screen. Although this is a personal preference, I found that the screen looks best when it’s about 12 inches from my eyes –- in my case about the same distance as reading material. Trouble is, if you lay it down on a typical desk, table or airline tray table, it’s going to be further away. It’s still acceptable, but not ideal. So for the best viewing position you need to hold it in your hand, which can get uncomfortable after a while. Given the market for iPod accessories, I’m sure someone will come up with a stand and, who knows, maybe something you wear around your neck that puts the iPod into a good viewing position. It’s also important to point out that many people do have options when it comes to portable video. I still prefer to watch movies on my laptop when I travel. Some people have portable DVD players. Still, there is something to be said about having a video player that can fit in your pocket. Unlike a laptop, you can pull it out if you find yourself with a little time on your hands, like waiting in line or –- though some people might consider this rude –- while waiting for your meal to come at a restaurant if you’re dining alone. It’s also a pretty good answer to the nagging "are we there yet" question kids tend to ask while riding in the back seat of the car, though, as a parent, I prefer having the kids look out the window and interact with others in the car. You don’t have to be all that desperate to download a copy of "Desperate Housewives." You can do it from within the new version of iTunes (6.0) that was also released last week. Apple cut a deal with Disney (which owns ABC) to allow users to download episodes of two ABC hits – "Desperate Housewives" and "Lost" as well as some Disney children shows. You can download music videos and shorts from Pixar. Apple CEO Steve Jobs is also head of Pixar. Most shows and music videos cost $1.99. It took me just over 20 minutes per episode to download "Desperate Housewives" and "Lost." The shows, which run an hour on TV with commercials, are commercial-free and run for about 43 minutes. You can also watch the shows full-screen using iTunes on a PC or a Mac. Because the new iPod is a full iPod there is no doubt in my mind that it will do well because the video, however trendy, is an add-in that is icing on the cake. If you already have an iPod, I see no reason to rush out and replace it since, even without an iPod, you can still get a free copy of iTunes 6 and watch these shows on your computer. Still, with the video, thinner models, more storage and competitive price, there’s no question that Apple will continue to dominate the portable digital music player market. Oops, make that portable digital media player market.